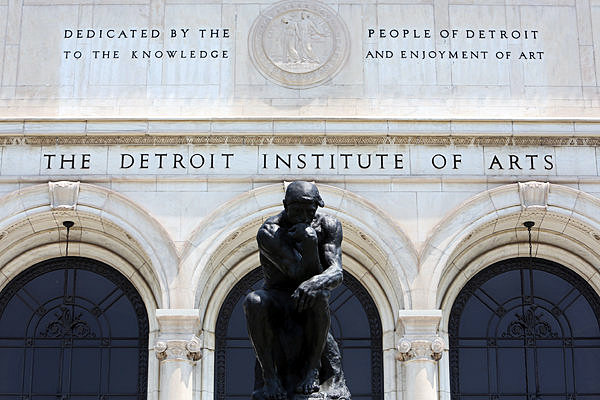 People living in the Detroit Metro area need to know that the Detroit Institute of Arts’ (DIA) collection is among the top six in the United States, comprising a multicultural survey of human creativity from prehistory through the 21st century. The museum contains 100 galleries of art from around the world, housing 65,000 works of art. The collection is valued at up to $3.1 billion according to a 2014 appraisal. The collection was in part due to the early curatorial work of William Valentiner, a scholar and art historian from Berlin, who was the director from 1924 to 1945 that laid the foundation for significant works of European, African, Asian, Native American, Islamic, and Ancient art. Diego Rivera’s Detroit Industry cycle of frescoes spans the upper and lower levels to surround the central grand marble court of the museum. To celebrate the 2016 Christmas season, here are four works of art that are prominent in the DIA collection that depict and exemplify Christian imagery. 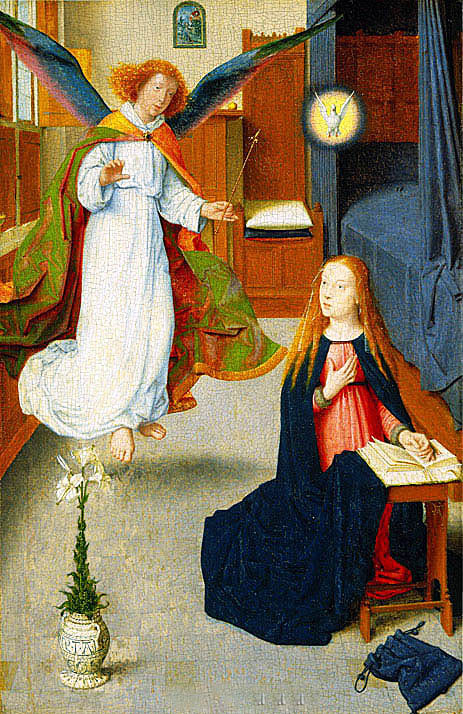 Gerard David, the Netherlandish painter, in this early single perspective work, elevates the Archangel Gabriel in mid-air, to announce to Mary that she is with child, the Son of God. Guided here by an unusual depiction of the Holy Spirit, she reaches for her heart. David, best known for his altar pieces—in particular the assimilation of Italian art and the shifting focus from the traditional iconic image of the Virgin and Child to their portrayal as human presences—was influential to other painters. Known for his use of color, his religious scenes achieve a soft and serene use of light, and it comes later in the 19th century that he has a major influence on the painters in Bruges, and Antwerp. 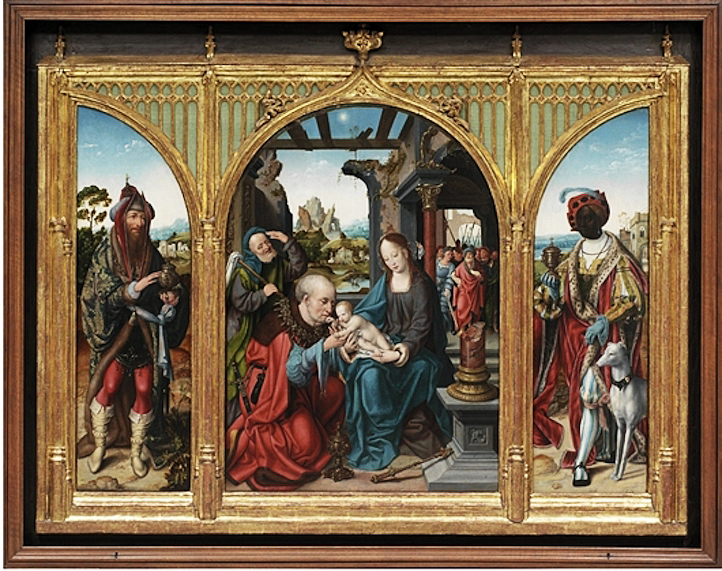 A young colleague of David from Antwerp, Joos van Cleve, produced many versions of the Virgin and Child, and the Holy Family, which were very popular during his time. The triptych with gilded framing is a good example of his work, full of charm and tenderness that was popular with later collectors. Particular to this painting is how Joseph, from the house of David, plays such a prominent part with his adoration the newborn child. Traveling across Europe to Venice during the same period, Giovanni Bellini stands above all others, intimately associated with Madonna and Child, and not just in sheer numbers, but his ability to imbue his sacred images with such conviction. On a recent visit to Venice, I was fortunate to see an exhibition of his work in the City Museum at San Marco. It was on my return to Detroit that I realized this work, Madonna and Child, oil painting, 1509, was part of the DIA collection. Born in Venice, Bellini was raised by his father, a painter in his own right, who allowed for some collaboration on his paintings, Crucifixion, and Descent of Christ into Limbo. Bellini developed an innovative style using traditional imagery and meaning but developed a proclivity and self-awareness that served him throughout his career. 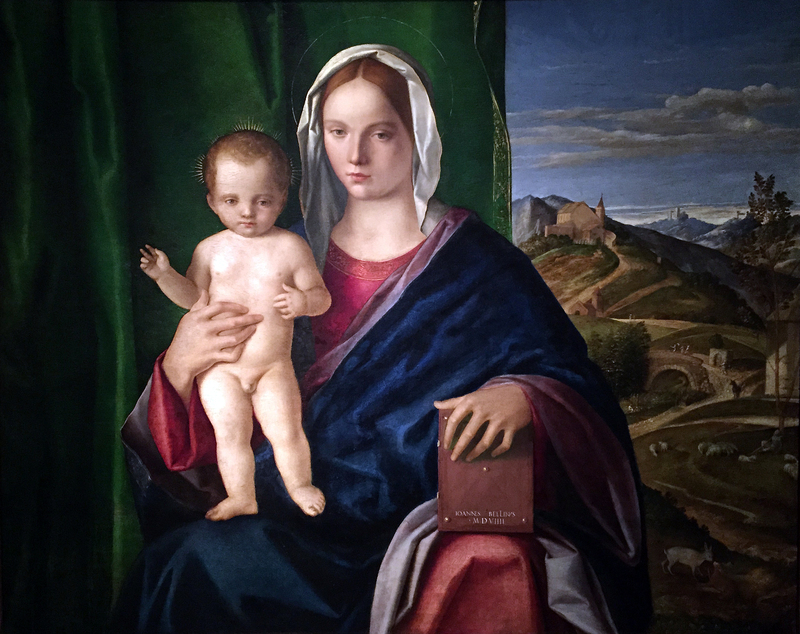 In many of these paintings, he adds landscapes as a backdrop to the subject, often filled with activity, but largely created a depth of space that gives the viewer a self-assured presence with the Madonna and her gaze. Ultimately, Bellini eliminated the parapet from his compositions and provided worshipers with a sacred visionary presence. The illusionistic tension between the beholder and the sacred figures becomes a dramatic force in Bellini’s work that separates him from so many painters of his time. In this painting, Mother and Child, the seated figure is surrounded by angels supported largely by primary colors, where the mother figure is the only one facing the viewer. Fra Angelico has succeeded in creating work that continues to reveal his preoccupation with humanity, humility and piety. 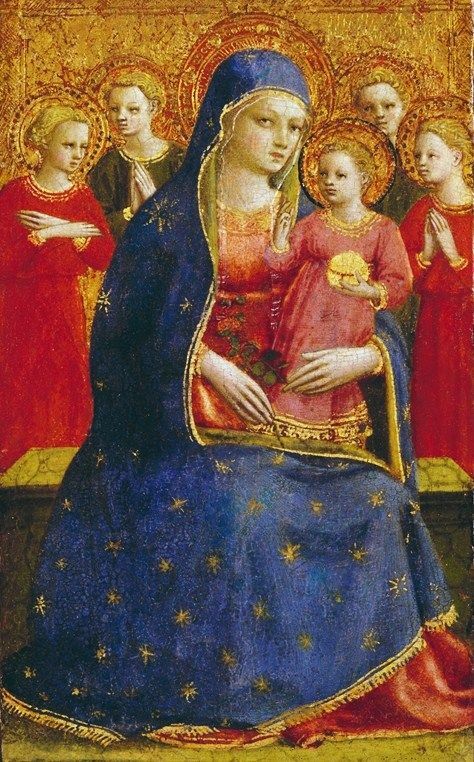 Fra Angelico was born in the Tuscan area of Mugello near Fiesole towards the end of the 14th century. The first record of Angelico as a friar dates from 1423, when he is first referred to as Fra Giovanni, following the custom of those entering a religious order of taking a new name. Although his long career began around 1417 when he worked at San Domenico convent in Fiesole between 1420 and 1440, I am most familiar with his fresco work that began in 1441 at San Marco convent in Florence, Italy. Living in the convent, away from the constraints of wealthy clients, his more that 30 meditative frescos depict the life of Christ while paying tribute to St. Dominic. Most famous is his Annunciation at the top of the staircase to the second floor of cells. The museum of San Marco is renowned for its work by Fra Angelico and the preservation of the Dominican Order. Although all these paintings are part of the DIA collection, they rotate in and out of the European Gallery Collection and may or may not be on display in a gallery at this time. I have know way of knowing, but there must be a celebratory atmosphere at the DIA, with the Grand-Bargain behind them, and a new President and CEO, Salvador Salort-Pons, who is motivated to make the museum the cultural center of the Detroit. He has just now, put in place, a new curator of Contemporary Art, Laurie Ann Farrell, along with two assistants, Lucy Mensah, and Taylor Renee Aldridge. In addition, there is a three-year multimillion-dollar commitment to African-American art, designed to bring Detroit’s majority black population into the museum. During this holiday season, for the people in the Detroit metro area, there is much to appreciate and be grateful, for years to come. 5200 Woodward 9 a.m.-4 p.m. Tue. -Thu., 9 a.m.-10 p.m. Fri., 10 a.m.-5 p.m. Sat.-Sun. 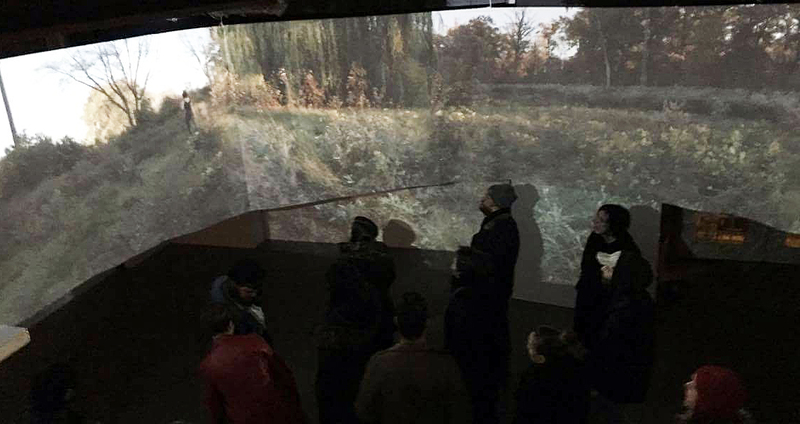 The Library Street Collective opened an exhibition, Pain Management, by Detroit-based artist Beverly Fishman, December 10, 2016. The installation consists of seven pieces that continue a theme Fishman has been exploring for several years: pharmaceutical products. Having read the press release, one would think they’re reading a pharmaceutical briefing from Pfizer, Merck or AstraZeneca. Perhaps the artist describes her work regarding pills, tablets, and Big Pharma, but this work stands on its own in terms of the abstraction of form, shape, and color. The first comparison that comes to mind is the work of Frank Stella from the 1970s, who studied the work of Josef Albers and Hans Hofmann. 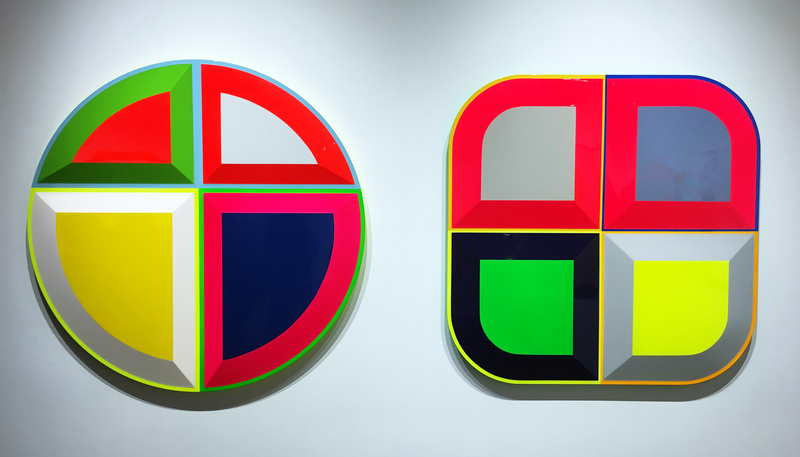 He went on to developed a large number of geometric-shaped canvases that use a taped, hard edge to separate his bright colors. In Fishman’s work, these high-gloss painted wood objects go much further in demonstrating a sophisticated level of craft and, in doing so, take the abstraction to a new level. She uses hue and texture to create an illusion that gives way to dimension. Fishman’s “more than paintings” have a unique edge that reminds the viewer of how serious she is about creating a beautiful object. Educated at the Philadelphia College of Art and Yale University, Fishman is now Artist-in-Residence and head of painting at Cranbrook Academy of Art. My guess is that her artistic sensibility was formed in a time when abstract expressionism and color field painting was at its height. Josef Albers, the German artist who fled Europe, was part of the Constructivist and Bauhaus movements and was part of what brought this hard edge into abstraction in the United States. While at Yale as Head of Design in 1963, Albers published Interaction of Color, which laid down and articulated his theory on how colors were governed by internal and deceptive logic, as illustrated in his 1965 Homage to the Square. In earlier work, Fishman made large-scale pills and tablets as art objects, highly fabricated using glass and displayed in groups on the floor. While her exhibition Pill Spill at the Detroit Institute of Arts in 2014 gave audiences something to think about, this writer is not interested in what drives her imagery. Moreover, the design and execution itself as an art object seems paramount. This new work hangs on the wall and dazzles the viewer with its high technological approach to creating a brightly colored surface where primary and secondary colors are juxtaposed, including thin strips of opposing color at the edges. Fishman’s new work engages the viewer with these painted wood objects using a process commonly associated with industrial fabrication. The work is more like a Gran Turismo Maserati than a KIA sedan. She uses coated aluminum, wood, polished stainless steel, cast resin, phosphorescent pigment, and urethane paint, to punch through and establish an abstract idea. This is the strength of her new work, more the artist, and painter in a modern time. Is there a physician’s prescription required to purchase the work: I think not. 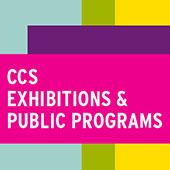 Library Street Collective specializes in cutting edge modern and contemporary fine art with a primary focus on artists who have developed their skills and visual art in public spaces. Located in the heart of downtown Detroit, Library Street Collective continues to cultivate a culture of exploration and art appreciation. Whoso list to hunt, I know where is an hind. The roving eye of the viewer (I can’t help but signify the viewer as “he”) moves first at a leisurely pace, taking in the magically lit landscape. A dark void follows his gaze around, blotting out, for us, what the viewer is not looking at. A figure materializes from the trees- the powerful form of acclaimed dancer and choreographer Biba Bell. But as for me, helas, I may no more. She moves in this strange, wild clearing with natural grace, as if she belongs there. She approaches the viewer like a wary fawn. The viewer’s gaze swings toward, then away from her in a rhythm that visualizes the meter of a sonnet, with its round, half-stepping rhymes. Untitled Experiment of the Modern Gaze can read, at first, as fairly unexperimental, aside from its installation, coiling around the gallery on screens installed in a huge ring. The scene it captures could be presenting the figure, a woman, as an allegory of nature, as a delicate, wild creature, not quite autonomous, a Pre Raphaelite sylph. The gaze, at first viewing, feels male in its invisibility and its meandering power, turning first toward, then away from, the woman as she floats upon, and interacts with, the landscape. What disrupts this is the woman approaching the camera and returning its gaze in an act that suddenly establishes her as autonomous from her surroundings. The camera, seemingly put off by this direct appraisal, begins to turn more quickly, it’s black void following it, engulfing more and more of the scene. The sonnet winds in toward its break. The allegories of nature and the hunt are inverted as the woman begins to pursue the camera’s gaze, chasing it as it turns faster and faster in apparent confusion. She halts it (the final couplet) and, applying physical strength to the dark voids that surround the gazer’s view, pushes them out of sight, unfurling the full majesty of the landscape, now seen in full circle. In a modern update of Wyatt’s poem, the woman is, indeed, wild for to hold, but she belongs to no one but herself. Once she has halted the camera, she turns and saunters back into the woods. Untitled Experiment of the Modern Gaze is on view at Popp’s Packing until December 17. 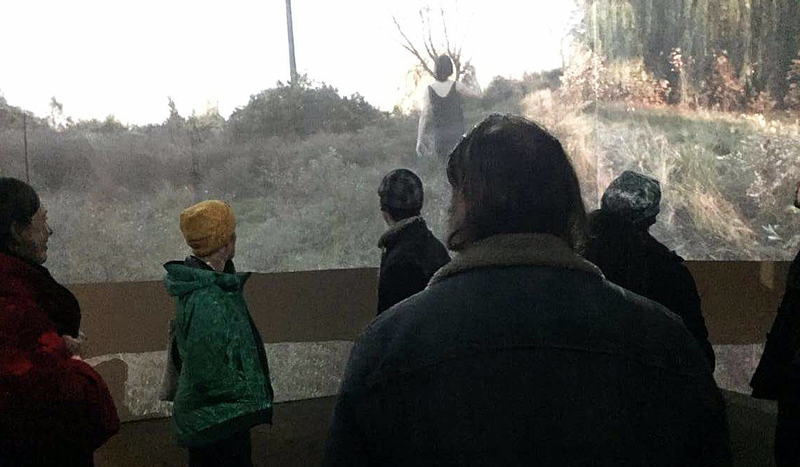 An artist talk with Oren Goldenberg and Biba Bell will be held at the gallery Wednesday, December 14, at 7 pm.